Now, I have been lucky enough to attend San Diego Comic-Con since 2007. I’ve seen this event, and nerd culture in general, undergo some huge changes since then. In 2007, the biggest news was the premiere of Iron Man, which has gone on to spawn three movies and a spinoff, The Avengers, which is now the highest grossing [comic book superhero] film EVER. Nowadays, it’s no big deal to bring up a comic book movie, or a video game, in discussion, even in a professional setting. People complain about this explosion of comic and game culture, but I can’t say it’s a bad thing, at least not yet. 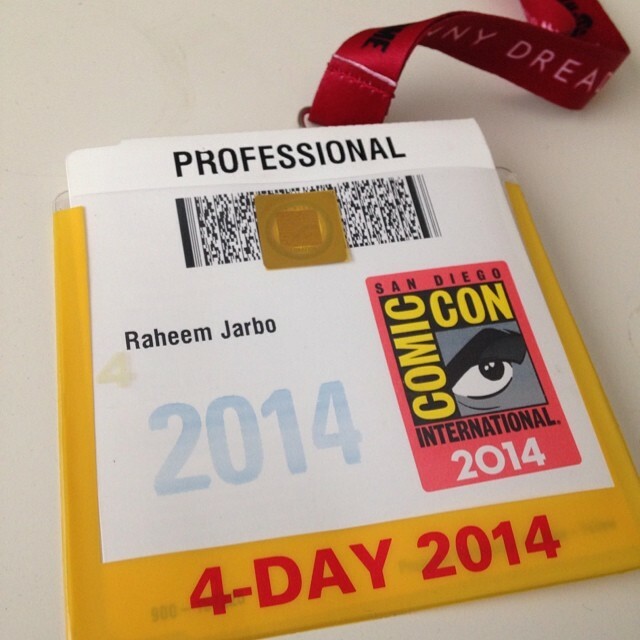 Anyway, this is Mega Ran’s Comic Con 2014 experience. I got into San Diego Wednesday, which is Preview Night for the Con. However, I had a performance at Gam3rCon, which was founded a few years ago as an alternative — not competitor — to Comic-Con. It’s smaller, more friendly, and more centered around gaming communities. This year’s con was a lot of fun, and I met some fans of mine who elected to come to this show, as opposed to any of the others, because of the size of the event. I played a fun set to an eager and enthusiastic crowd there. Thursday, I went to the Convention Center to brave Comic-Con. I had a panel in the evening, so that gave me time to walk the floors and halls. 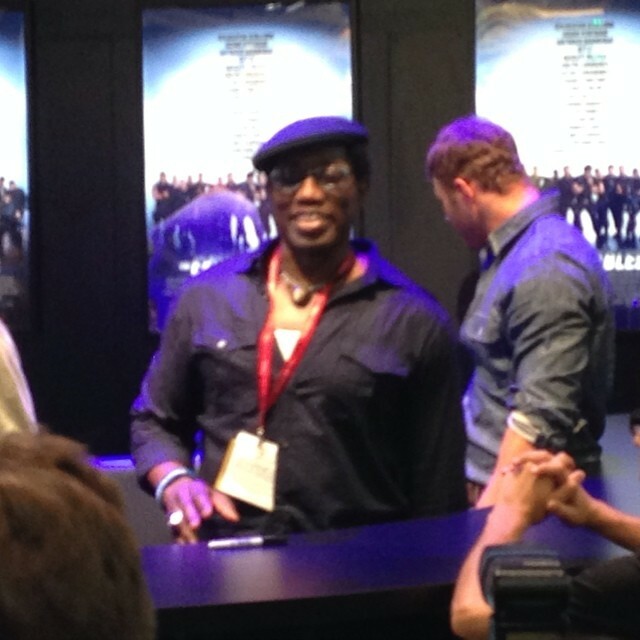 I saw so many great things, but what caught my attention (and everyone else’s) was a huge crowd at the Expendables booth, where Dolph Lundgren, Randy Couture, and Wesley Snipes made a surprise appearance for photos. This caused an instant traffic jam on the con floor as everyone stopped to snap pictures. I got a few and moved on. I prefer going to the smaller booths where the comic artists hang, rather than the big TV and gaming booths. I met Rob Liefield, creator of Deadpool, and a guy who has a pretty bad rap on the internet, but he was super nice and friendly to me. I also stopped at the Robotech, Hasbro, Nickelodeon, and Funko booths for toys — um, I mean collectibles. The panel went extremely well, as I was joined by some of my musical heroes turned peers — MURS, Mix Master Mike of the Beastie Boys, and many more. It was a packed room and the panel was very informative and fun. Big shout out to Patrick A. Reed for making it happen. 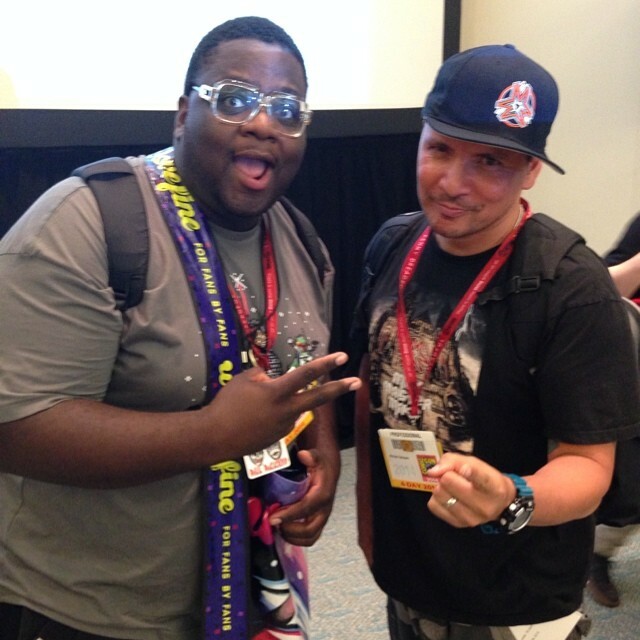 The one and only Mix Master Mike — we salute you! After that, I had to run to a special engagement, w00tstock, which is an event held at every Comic-Con for the past six years, started by nerdy folk duo Paul and Storm, with help from famous nerds like Wil Wheaton (Star Trek: The Next Generation, Stand By Me) and Adam Savage (Mythbusters). I played a short set and the crowd loved it. It’s always weird for me to play a rap show in a traditional theater with seats, but it went over well and by the end, they were up and dancing. Wil told me my set was great, as did special guest Craig Ferguson. We busted the myth that rappers don’t play. 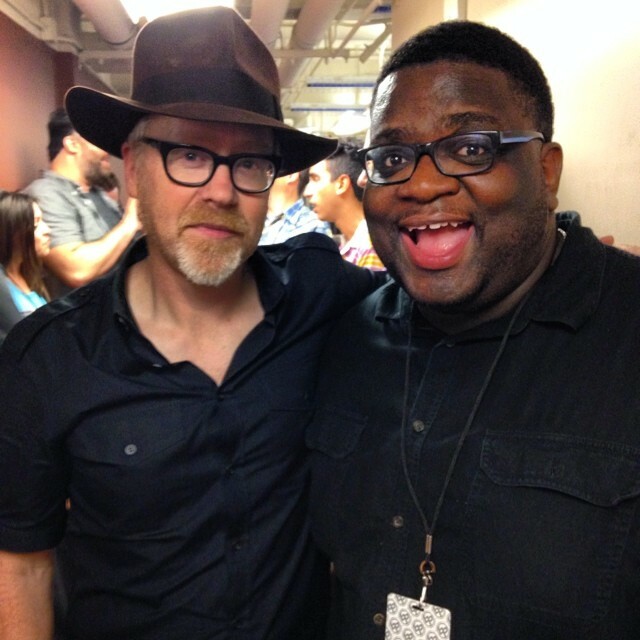 Shout out to Adam Savage! Friday was a bit more tame for me, my only events were in the evening, so I went to the Con again for a few hours, and sat in on some great panels. I watched Namco’s fighting game panel and saw some previews of Tekken 7, then went to a Q&A with Brian K. Vaughan, the writer of my favorite comic right now, Saga. He was great. After that I met with some friends and walked the floor a little more, picking up a Hip Hop Family Tree comic — which was incredible — and some shirts. I walked past the famous Hall H, as I wanted to get into The Walking Dead panel, but I realized quickly that was a lost cause. This is probably my number one problem with SDCC. 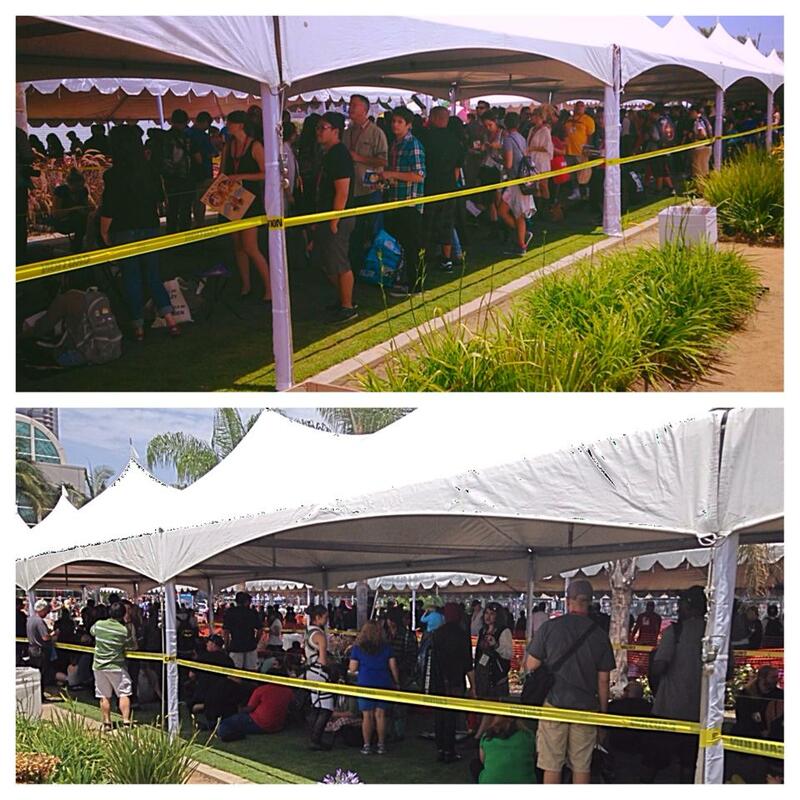 The line for Hall H is OUTSIDE, and is probably a minimum 4-5 hour wait, with no chairs or anything… and there’s still no guarantee you’ll get in, because they don’t clear the panel room out between panels. At least they added a tent in the last few years. I salute you, Hall H goers. That afternoon, I had an in-store event and vinyl release at Access Music, a local record store, which went well. I played some new songs off the new vinyl, and signed a few records that are at the store now, while supplies last. 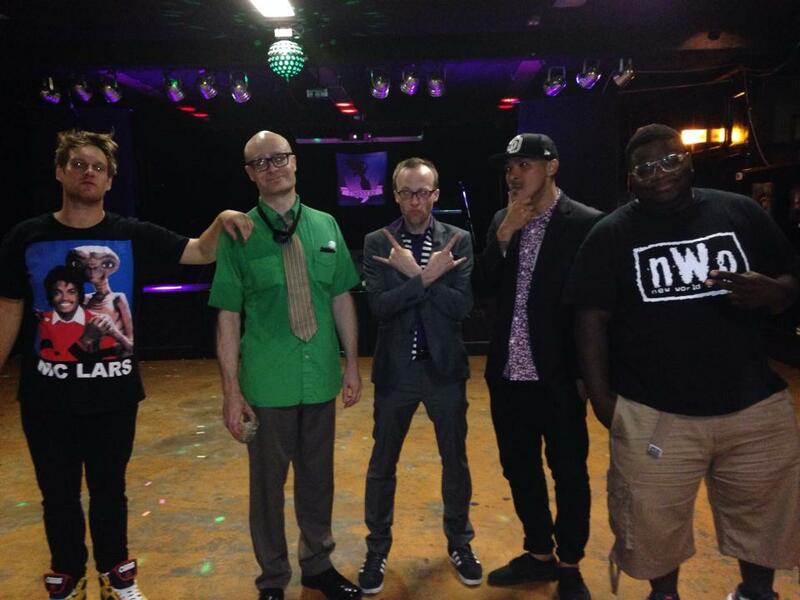 After that I made a special appearance at the Nerd-A-Thon show at The Merrow, featuring MC Frontalot, MC Lars, Schaffer the Darklord, Doc Awk, and Star Wars Burlesque. I played a surprise set which got the crowd ready. I had a fun time out there and met some great new and returning fans. Saturday was my day off of Comic-Con. I knew from past experiences that Saturday is the most crowded day downtown, where lines would be the most ridiculous, and people would be the most pushy, so I stayed back. My lady and I went to La Jolla to the Windansea beach, and relaxed, then ate some delicious Mexican food. It was just the break I needed. On Sunday, we returned to the madness after scoring a second badge from my friend. I returned to Comic-Con to get another look at some of my favorite booths. I feel like my favorite this year was DC Comics, who were celebrating Batman’s 75th anniversary by giving out capes and comics, and they had an amazing display of ALL the Batman suits from the movies, plus some fan created variant costumes. I had the most fun checking those out. I can hope that one day that stuff will be in a museum to see. Did you know Batman ’89 wore Nikes? 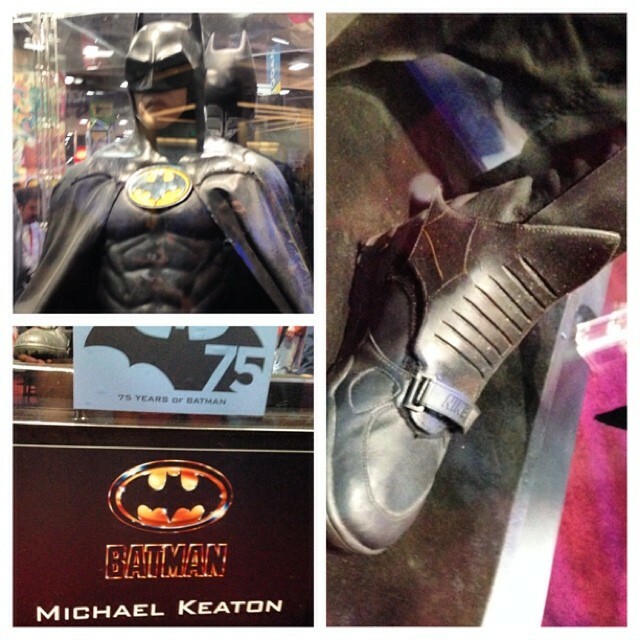 DC’s Batman 75 display is pretty awesome. 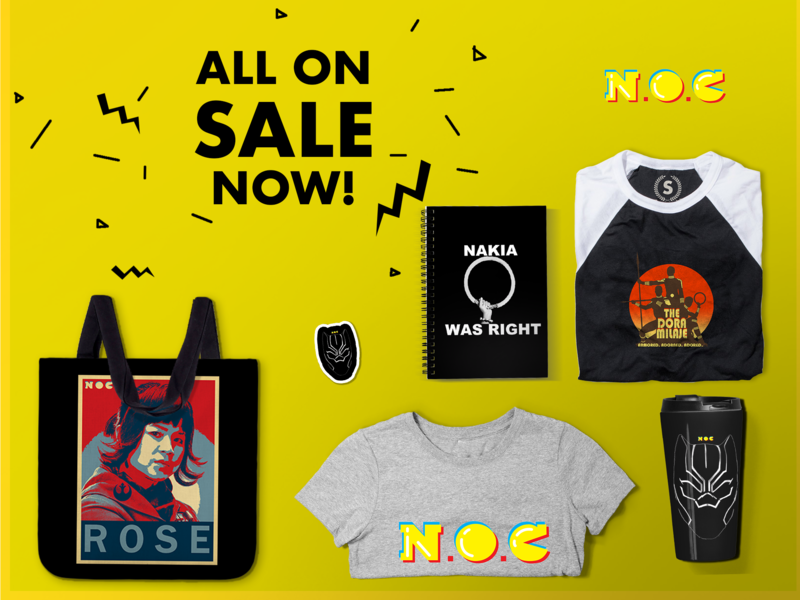 I walked around and spent more money that I didn’t have, before leaving to sound check for my final show, the Official Unofficial Comic-Con after-party by Random Gibberish, hosted by the voice of Duke Nukem, Jon St. John. The show was amazing. I walked around the whole room freestyling about costumes and trinkets. Overall I feel like this was my best Comic-Con experience yet, mainly because I did the right mix of networking, performing, sightseeing, and escaping. I feel like the security and volunteers did a decent job of controlling lines and keeping things organized. Random, aka Mega Ran, or Random Beats. Teacher, Rapper, Hero. 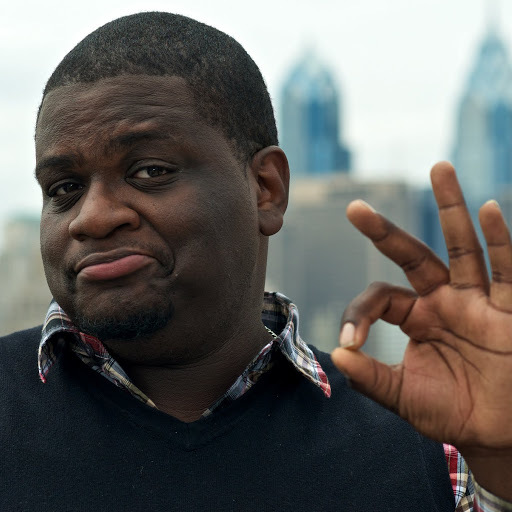 If you put video games, the 80s, hip-hop, soul music, jazz, and stand-up comedy into a blender and hit “puree,” you’d have something close to The Mega Ran Experience.